Ian Balfour, in his definitive work, Famous Diamonds, talks of the lore and legend of history's most celebrated diamonds. According to his list of the world's largest cut diamonds, lot 284, the 103.48 carat kite-shaped diamond, would merit a position amongst the world's top eighty. 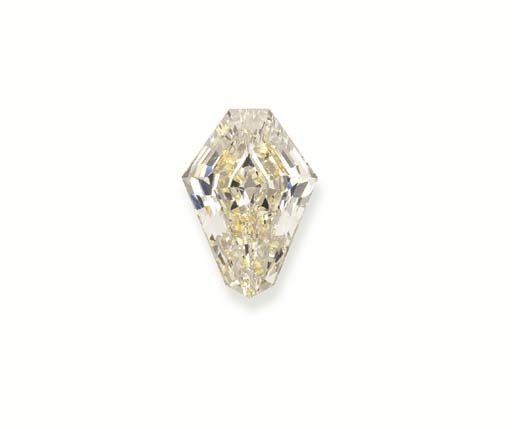 One of the closest in size to this diamond is the historic Ashberg, a light fancy yellow, cushion-shaped gem of 102.48 carats that realised $600,000 at Christie's Geneva in May 1981. According to Christie's records, over the last two decades, only seven diamonds over 100 carats have been sold at auction. All have been exceptional in their combination of cut, colour and clarity and the name given to each of these rare diamonds represent their unique and memorable characteristics. This spectacular and, as of yet, un-named diamond is a great gem now available to highlight the most significant diamond collections in the world.